Let's fight ghost story was on the edge of revealing too many things, the viewers were curious about. Finally Hyun Ji get back to life it was her good luck that professor Jo's bad evil couldn't harm her. Every one was happy to see Hyun Ji wake up after 5 year coma. But unfortunately she lost her memories and couldn't remember anything what happened after her soul was wondering, neither anything regarding the hit and run accident. The half mystery was open how three of them were connected. On the other hand Chul Sang and In Rang bring Bong Pal to the same Hanil hospital where Hyun Ji was admitted. This was how the story came back to its connection. We laugh at Chul Sang question when he ask the doctor about Bong Pal serious injuries did he need adrenaline or intrubation , and the doctor replied "You watched too many medical dramas". We don't know about Chul Sang but we really watch too many medical dramas and was inspired of it. In Rang was curious about Bong Pal why he is like this. 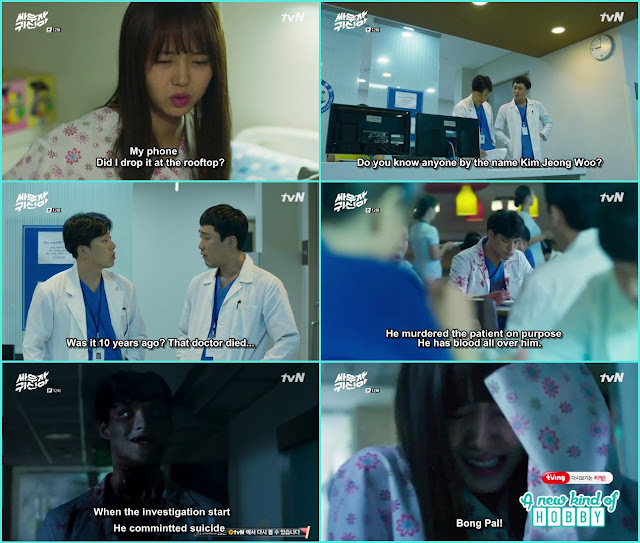 It was the bitter and heart breaking reality when he heard by Chul Sang Bong Pal was the man Hyun Ji likes. MonK myung was all woried for Bong pal he wasn't at home. He called and found out BonG Pal is at Hanil Hospital. Another scene make us smile when Monk Myung arrived at the hospital and Chul Sang introduce himself as his business partner. My sister now he will be in trouble. The second moment he give the business card to Monk Myung and receives a scolding. It wasn't a simple scolding but he was feeling that his ears might get ripped ehehehe. I feel sorry for Chul Sang he is nice guy with a good heart to help and care others neither In Rang grandmother like him nor Monk Myung. In Rang accidentally saw Hyun Ji on his way back. There was a big crowd where every one gather to see the girl who came back to her senses after 5 years of coma. In Rang told Bong pal about Hyun Ji, it was a happy news Bong Pal ran over there but shocked by Hyun Ji's behaviour. She didn't remember who he is. With the broken heart he came back home with Monk Myung. Chul Sang and In Rang feels sorry for him for Hyun Ji. They searched and gathered some details and head back to Bong pal's home and told him all the situation a hit and run accident which made Hyun Ji lost her memories. She needs some time and its good that she wasn't a ghost. The detective didn't give up on the case, he reopen an old case which was related to Professor Jo Hye sung family. It was his father suicide case but many things were missing that made the detective suspicious. We also want to knew how Professor become this evil and who push his father from the balcony what was the reason. Hyun Ji started to recover quickly and the rehabulation therapy started. Professor Jo was doing the community welfare at Hanil hopistal. There he met Hyun Ji and showed her his good side. This scene make us worried for Hyun Ji's life and safety. Bong pal visit Hyun Ji and bring her belongings. Hyun Ji was upset by all the situation and couldn't believe that they both knew each other. Bong Pal reveals that he is "Namja Chingo/ Boyfriend" of her. She was shocked to hear and couldn't believe. Bong Pal saved his number saying she can call her anytime when she miss him or wanted to hear his voice. Also he will visit tomorrow, the day after tomorrow and so on till her memories cam back. Hyun Ji mother saw the toothbrush and told her that its exactly the same choice as she like. While checking her belongings she saw the retreat pictures and suddenly remember the scene of the lake. Her mother got worried she sid her head hurts. We were happy its the sign she will definitely remember hr memories when she was living as a soul. 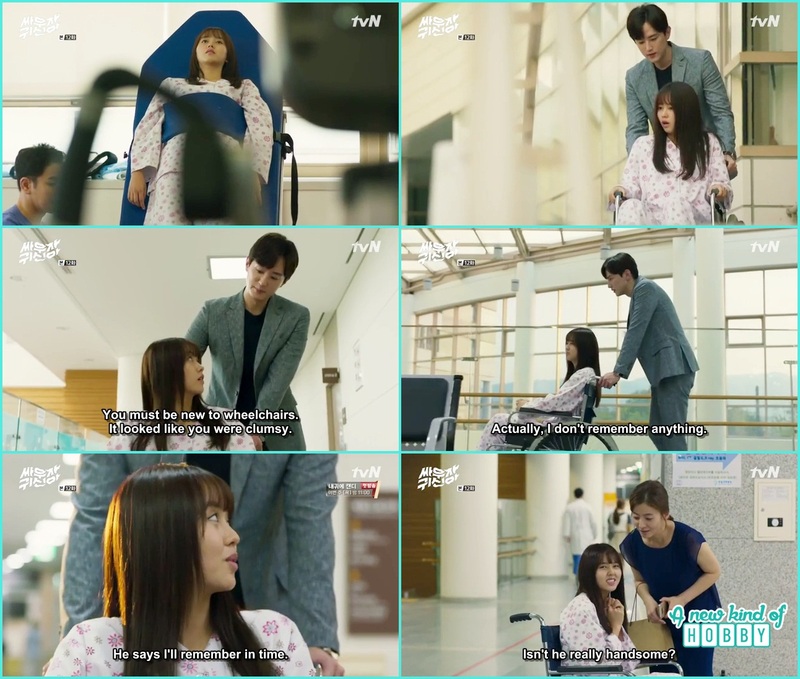 The doctors were happy to see Hyun Ji recovering so fast. After finishing her exercise session on the way back she saw Professor Jo who was volunteering with the kids. I thought Hyun Ji might remember something seeing Professor with the puppy but it wasn't so. Professor became friendly with Hyun Ji. MonK Mayung came to visit Hyun Ji after knowing that she wasn't a ghost but a soul who was wondering. He feels sorry for his harsh words and rude behaviour. He apologize with her mother because Hyun Ji wasn't around. On his way back he saw Professor at the hospital's lawn and become all suspicious of his presence. At the same moment Bong Pal came and ask Monk Myung why he is here and saw Hyun with the professor. He was surprised saying why is Hyun ji with the professor. Finally Monk Myung come to knew the girl sitting with professor is actually Hyun Ji. It was a good thing that Monk Myung notice and might he help Bong Pal and Hyun Ji in future. Bong Pal pack a lunch for Hyun Ji at first she refused but knowing about its her favourite meat dishes she agreed to eat them. We were happy for Bong Pal. Hyun Ji said she will only taste as he put too many efforts making all this but it wasn't a tasting its seems like she was filling her empty tummy. Bong Pal "She loves food both as ghost and a human". Professor Jo's bad time started. We were sure that one of three will going to give a tough time to professor. But who will it be to take a step first. 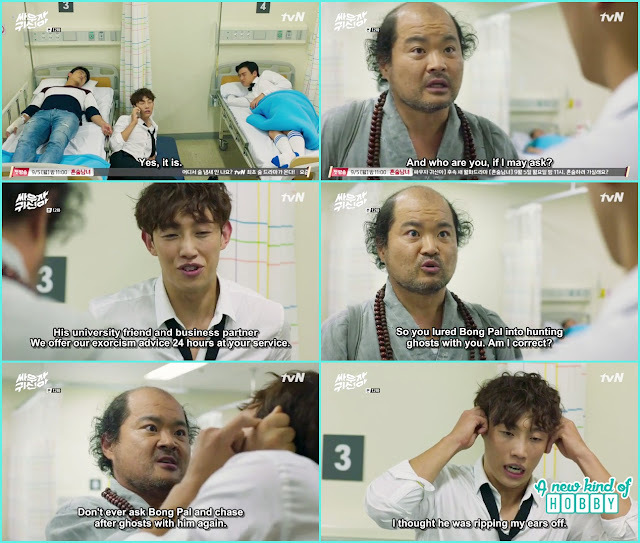 It comes out to be Monk Myung right after leaving the hospital he visit Professor Jo Clinic he wasn't around. Monk Myung ask to use to washroom and step in Professor office. 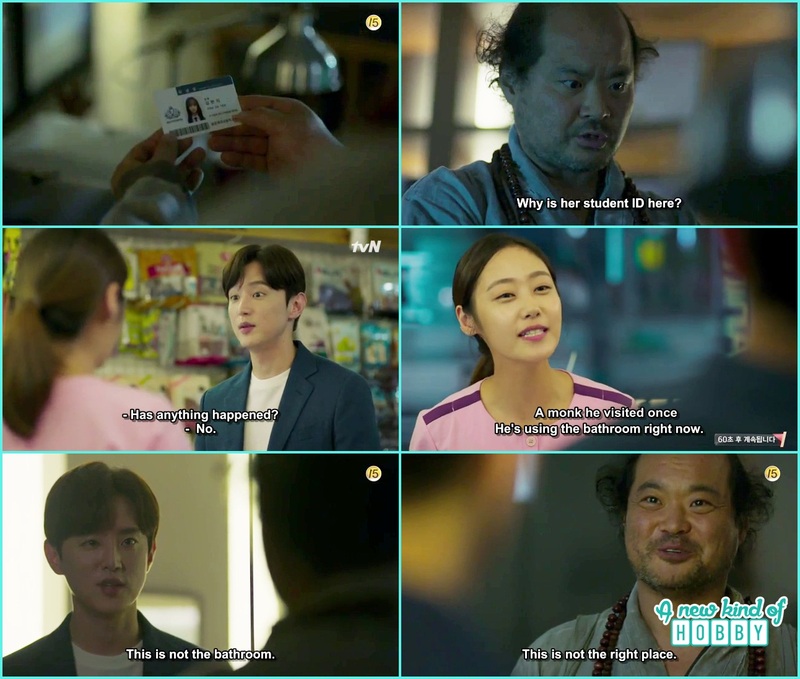 There he saw Hyun Ji's ID and surprised why her student ID is in Professor's possession. My sister thought Monk Myung will find Bong Pal's father phone but it come out to be Hyun Ji and it was for the good. Unfortunately Professor came after few minutes of Monk Myung they both met each other Professor ironically "This isn't the way to the bathroom" and we though he would strangle Monk's neck like he did to the female student before. But smilingly Monk Myung it seems i got lost. Hyun Ji after having hearty meal say's thank you and left for her room. Bong Pal offer he would walk her but she refused and suddenly tripped her leg. 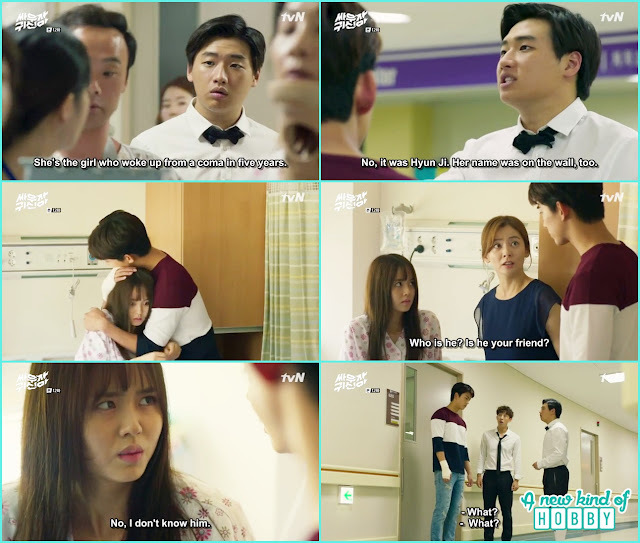 It was Bong Pal's quick movement she hold Hyun Ji's back and saved her from falling on the ground. He fell back hurt his back and Hyun Ji fell on him. It was a romantic scene they were about to kiss but couldn't. 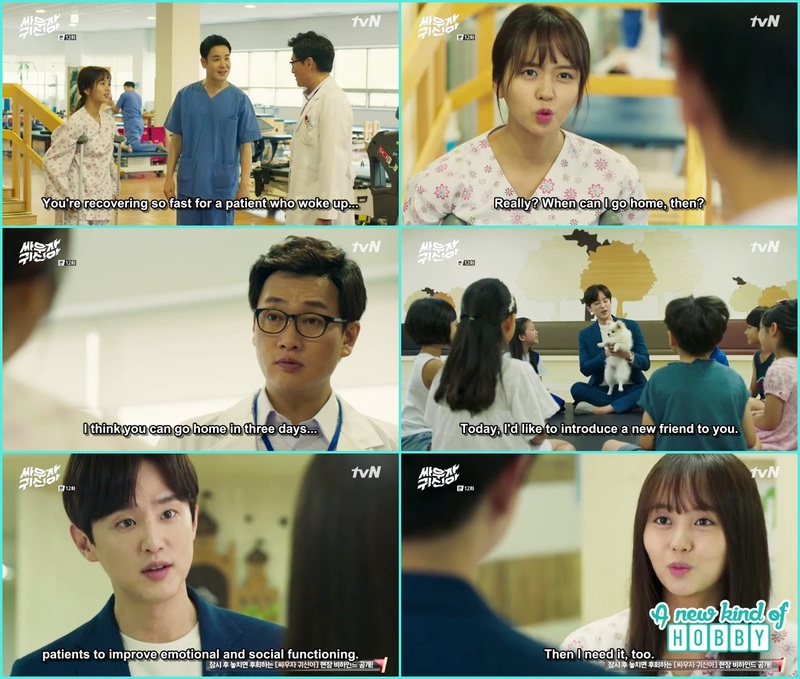 Hyun Ji remembers her first encounter with Bong Pal as she was living as a soul. Remembering this made her too angry. She hit Bong Pal shouting "We were nearly to kiss ... i have never kissed anyone" bong pal "You already had your first kiss". Listening this she again started to hit Bong Pal and left. Bong Pal "She is such a good fighter". On her way Hyun Ji was smiling talking to herself "Punching him is kind of fun". As Hyun Ji was a bit clumsy she lost her phone. 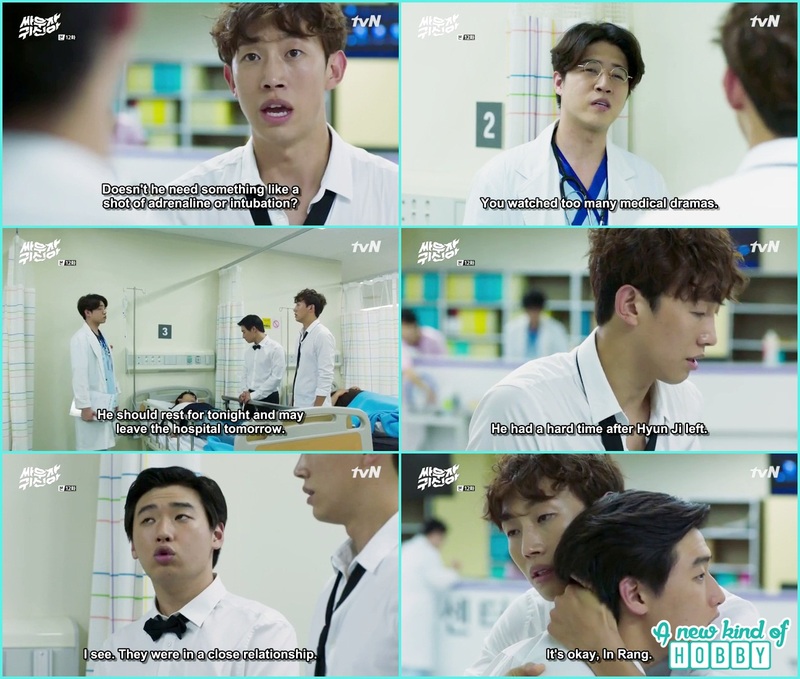 The doctor in charge came to check on the daily round, Hyun Ji ask him about the tall doctor Kim Jeong Woo. But he didn't knew about any of the doctor with this name at the hospital. My sister thought may be Professor Joo put an spy or evil spirit to keep an eye on Hyun Ji's movements. There was a possibility one of two things might be true. The doctor aska fellow doctor about this and come to knew that he committed suicide after urdering many patients at the hospital. Hyun Ji step out of her room to find her cell phone she feels that someone's following and got scared. But no body was there. When she turn around she saw Doctor kim jeong woo and got scared. It was his scary appearance in other words she saw Kim Jeong woo's ghost who was trying to attack her. She shouted "Bong Pal". My sister what's the reason for calling Bong Pal when she refuse to recognize him. Bong Pal was on his way to give Hyun Ji's cell phone and heard her screaming. The episode ends here. It was Hyun Ji's sentient that made her aware of danger and her subconscious made her call Bong Pal for help. We were wondering now he came back to life after coma how can she see the ghosts? Does she become like Bong Pal is a mystery to knew what let her see the ghost. Its all for now happy K drama watching. 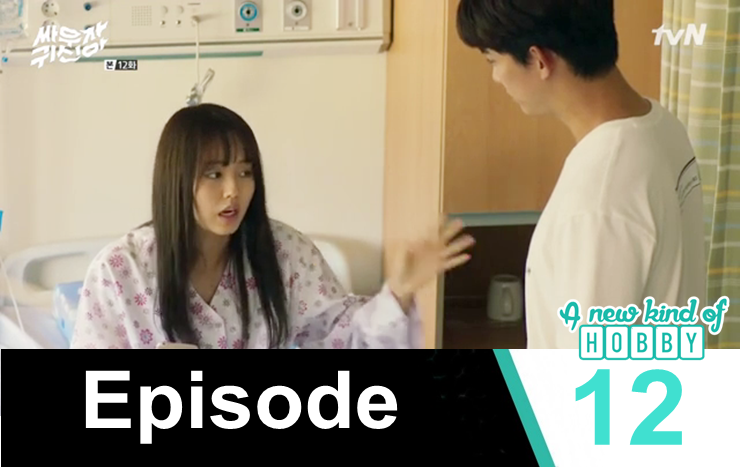 Let's meet in episode 13 review.